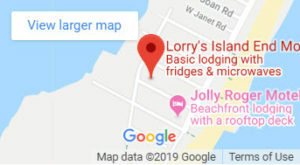 I go on vacation very little as thankfully Lorry’s Island End Motel is busy even in the off season and winter months. In 2011 Lorry’s Motel set a record of 74 days in a row during the summer sesason without an opening. However, it was during the off season and I had never been out West and decided to go to a Joyce Meyer Conference in Phoenix, Arizona. I found a phenominal little Bed & Breakfast in the Arizona Desert named Coyote Trail B & B. Mary Jane & Dodie, the owners, treated me just like we take care of our Guests when they stay at Lorry’s Motel. I highly recommend that you vacation at Coyote Trail B&B when going out West. The address is 2104 S. Coyote Trail in Mariocopa, AZ. Please call Mary Jane 520-238-9002.